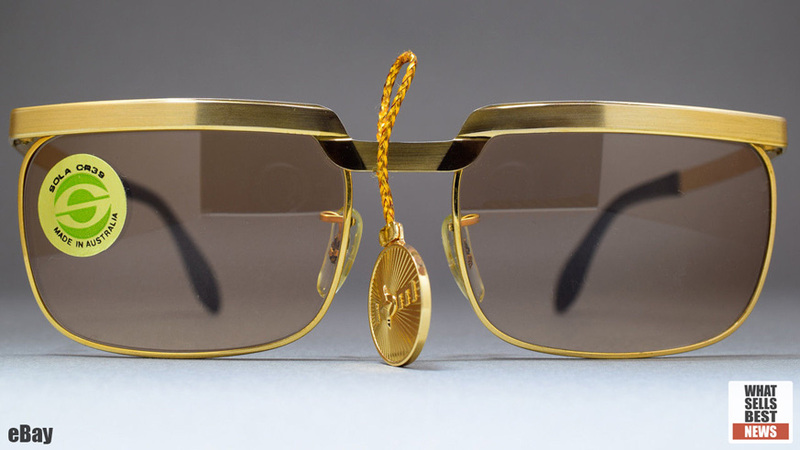 1970s IOM brand sunglasses ignited a bidding war on eBay. ONLINE - A pair of Vintage Sunglasses have fetched $20,000 after a spirited bidding war on eBay, which ended on April 8, 2018. The sunglasses, described by the seller as: Circa 1970s IOM Brand (International Optical Mfg.) $ Solex 14K 1/25 gold filled No. 503 Sunglasses. New with tag, never worn, and made in Hong Kong (with a sticker indicating the lenses were made in Australia). GWS Auctions reported Elvis Presley's "Last Hawaiian Vacation" sunglasses, fetched $159,000 after buyers premium in 2018. Bonhams reported, sunglasses worn by Steve McQueen in an opening scene of the 1968 film, 'The Thomas Crown Affair' fetched $70,200 in 2006. Juliens reported sunglasses worn by Michael Jackson during his 1984 'Victory Tour,' fetched $62,500 in 2011. Juliens reported sunglasses worn by John Lennon, fetched $36,000 in 2007. Christie's reported a pair of Tom Ford sunglasses worn by Daniel Craig as James Bond in 'Quantum of Solace,' fetched $33,000 in 2012. Christie's reported a pair of sunglasses belonging to Marilyn Monroe fetched $27,000 in 1999. Heritage reported sunglasses worn by NASA astronaut Gene Cernan on the Apollo 17 mission, sold for $20,315 in 2008. Juliens reported, the Ray-Ban sunglasses worn by John Belushi in the 1980 film 'The Blues Brothers' fetched $16,640 in 2012. Juliens reported, the neon green and black wraparound sunglasses worn by Freddie Mercury in the 1989 Queen video for 'The Invisible Man,' sold for $11,875 in 2015. Juliens reported a pair of Tortoise Shell sunglasses belonging to Charlie Chaplin fetched $10,000 at auction in 2012. *Top-ten list is meant to be illustrative, not comprehensive. If you know of sales we should consider for the list, please let us know. The following sites list their best selling sunglasses by sales volume/orders taken. Links open on the associated sites. See the highest-bid sunglasses by style and/or brand on eBay, by using this search box, and viewing the results below. CARTIER Sunglasses 61399893 !!! FREE SHIPPING !!! Oakley sunglasses Lot of 5!!!! OAKLEY Whisker Sunglasses With Soft Bag Only $0.01!!! Authentic GUCCI WOMENS SUNGLASSES GG 1058 Black With Ivory Rim Frame. 57 MM.